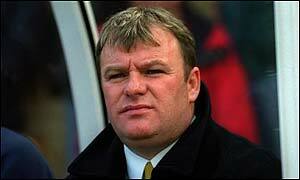 Former Boston United manager Steve Evans has been found guilty of impeding a Football Association inquiry into contract irregularities. Evans' former chairman Pat Malkinson was also found guilty of impeding the inquiry and of authorising illegal contracts. Both men will be punished at a separate FA hearing in January. Evans has told BBC Radio Lincolnshire he will appeal. And in statement issued through his solicitor the former Boston manager said: " I am confident that had the FA not breached its own rules, I would have been acquitted." Evans, who steered the Pilgrims to promotion from the Nationwide Conference to Division Three last season, had already admitted four breaches of FA rules. They related to his involvement in the lodging of registered playing contracts containing details which were false. But he had denied four other charges relating to contract irregularities and impeding the inquiry. Malkinson has denied two charges relating to contract irregularities and impeding the inquiry.